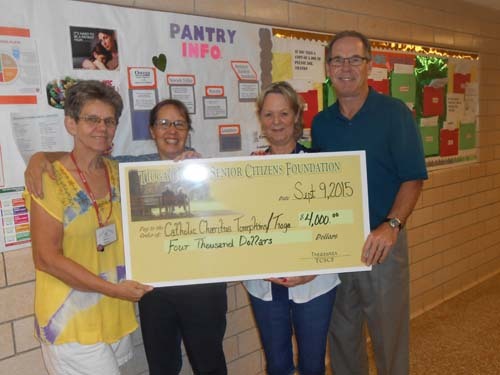 On September 9, 2015, David Woodburn, from the Tioga County Senior Citizens Foundation, came to the Catholic Charities Tioga Outreach Center with a check for $4,000 to help with emergency needs for seniors. This grant is primarily used for heating assistance before and after the HEAP program season. But in the past it has also helped with other needs such as security deposits for seniors relocating to subsidized housing, or for minor home appliance breakdowns. Last year, the Senior Citizens Foundation also helped Catholic Charities publish a booklet they wrote on preventing and coping with elder financial abuse. The Tioga Outreach Center is truly grateful for the Tioga County Senior Citizens Foundation’s assistance to seniors, many who have contributed much to our communities, and still do. Any senior with low income may call Catholic Charities at (607) 414-1023 if they need assistance.